The GCU Dance team performs one of its routines at the College Cheerleading and Dance Team National Championship. In its first time competing in Division I, the Dance team from Grand Canyon University placed fourth in Jazz Dance last weekend at the 2018 College Cheerleading and Dance Team National Championship in Orlando, Fla. The dancers, wearing a special braided hairstyle, celebrate their fourth-place finish in Jazz Dance at the nationals. GCU has competed in the event, considered the Super Bowl of college dance competition, since 2015 but previously was in the Open Division, mainly for colleges in Division II and the National Association of Intercollegiate Athletics (NAIA). It is managed by the Universal Cheer Association (UCA) and Universal Dance Association (UDA). 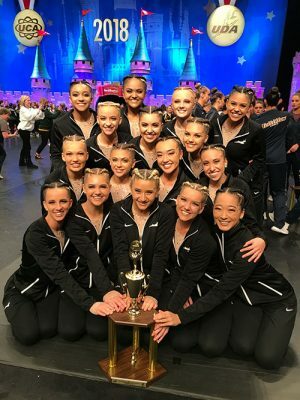 “We were understandably anxious about what moving up a division would entail – we were now competing against schools we hadn’t seen at nationals before, and the expectation was so much higher,” Head Dance Coach Jacque Genung-Koch said. The GCU Cheer team also was in the event and did not reach the finals, but that was secondary to the fact that one of the cheerleaders fell during a performance and had to be rushed to a local hospital. Fortunately, it was not a serious injury. “We made the adjustments we could without her and went back out and performed, which took tremendous heart,” said Emily Stephens, GCU’s Director of Spirit Programs. “Just like any other full-contact sport, cheerleading has its risks, and even though we do everything we can to avoid any mishaps, things can happen. The Cheer and Dance teams consistently have placed high in major competitions. Just last August, they won every possible honor for the second consecutive year in the UCA-UDA College Spirit Camp in Santa Barbara, Calif. But, above all else, both teams keep their faith front and center. Congratulations dance team and the cheer team for being strong through it all and representing all of us students here. My prayers go out to the individual who got hurt.